This summer, we found " sit spots " for those children who didn't nap. Last month, we found a "quiet space" for the non nappers in th cubbie area. 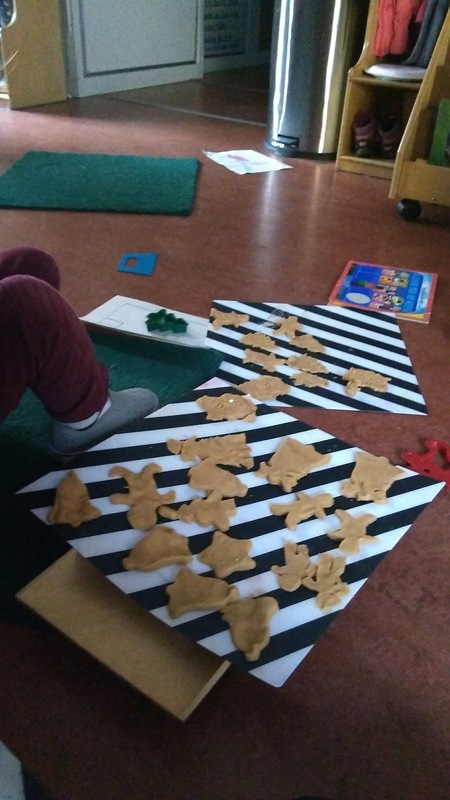 Everyday, a teacher stays with 6-8 children and the children have a quiet time reading books, drawing, do some puzzles. 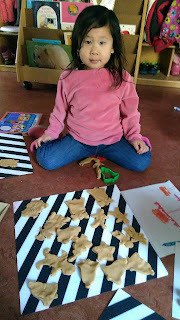 Yesterday, I brought a playdough and mats and books and paper with markers. 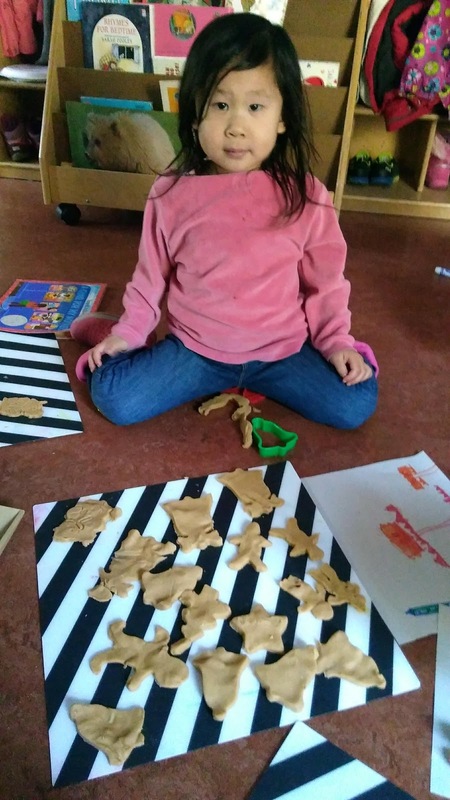 Monday, Mai made a playdough with gold gritter and she added some cinnamon powder. 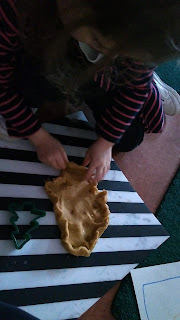 Roisin: Naomi this play dough smells real cookies!" 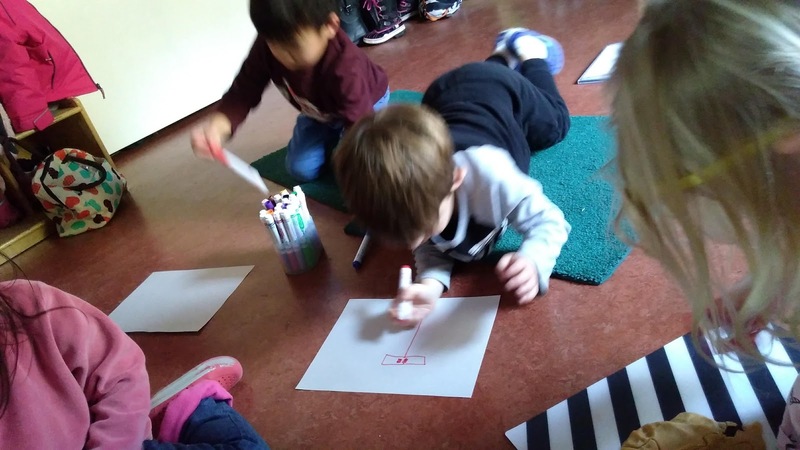 We are drawing a Christmas tree!! I am making yummy cookies! 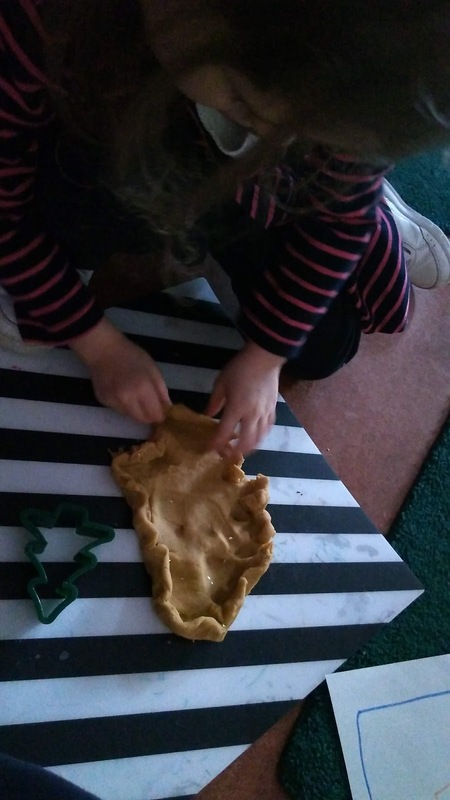 I am making a big Christmas cookie. I made chocolate ginger bread man cookies.Ready to bake! Now they are in a oven ! After all cookies "baked", Gwen shared them with the children. We all "ate" the delicious cookies. The children's conversation warmed my heart. I started to feel this holiday season and wondered if families were baking cookies or decorating their house like my family does. They all enjoyed quiet time sharing their family stories with cinnamon scent. 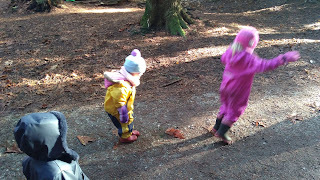 Yesterday morning, when we played at the forest. I collected some big leaves from the ground and put them as a line on the side of our forest play area. 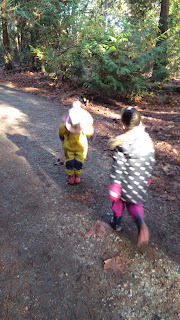 When I started to explain the rules of this activity, Simone noticed " Naomi I know! this is Hopscotch" . The beginning I set up the leaves in a straight line. After all the children had two turns jumping I placed the leaves in a zigzag shape. Adrienne : "Wow, now it is a zigzag! I can do it!!!" 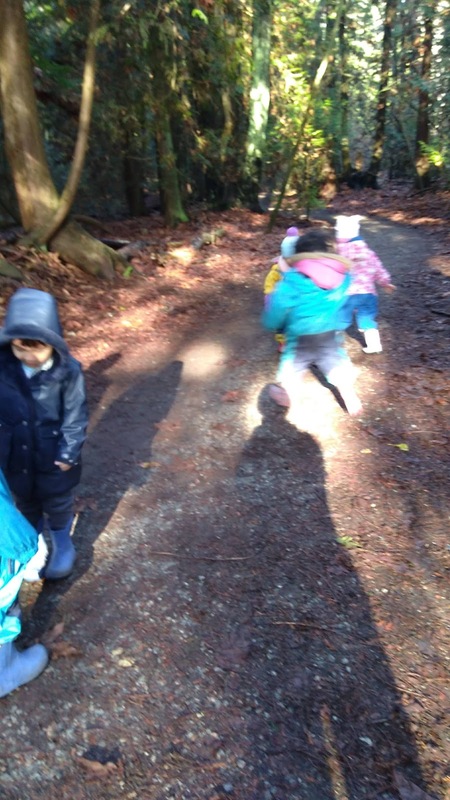 Almost 10 children joined the activity and a child said " My body is warm now Naomi! " It was simple activity that emerges from the children's delight in jumping and the lovely leaves in our forest. It was a very cold beautiful sunshine day!